The Walking Pilgrimage of summer 2009 (L-R) Cliff Hennings, Richard Goodin, Josh Van Cleef, Roger Lopez, and Fr. Mark Soehner. 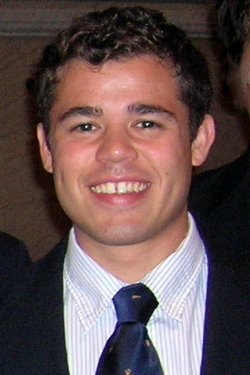 Joshua Van Cleef entered the Franciscan postulancy program with the Province of St. John the Baptist in 2007. He later discerned that God was not calling him to lifelong service as a Franciscan friar or brother, and in 2011 he left with the belief that he was following the same Holy Spirit that had first led him to enter postulancy. The time he spent with the Franciscans was invaluable and continues to influence his life and work today. Q. What led you to the Franciscan order? A. At the time I entered the postulancy program, I had some sense that I was being pulled at my core toward St. Francis and the discipleship he modeled. While I had long felt something in my depths calling me to a missionary life, that impulse was given new breath and more expansive horizons seen through St. Francis. Francis was missionary by nature, constantly moving from the center to the margins, driven by the Gospel and his encounter with the living God. Francis didn’t possess the truth or good news, but rather was possessed by it, and I wanted that too! So, I started reading about St. Francis and I wanted to know more and more about him. I wanted to be encountered by God the way he was, and encounter others the way he did. Leading up to entering, I was able to spend time with friars and other people discerning, and I got to know the Province of St. John the Baptist on my Come and See weekend. In the end, I knew that I was feeling a something real pulling at me to more deeply discern religious life, following in the way of Francis. I knew that the only way to discern was to dive in head first and take a risk. I believed I could trust the Province and take a risk with them. And I am glad I did. Q. 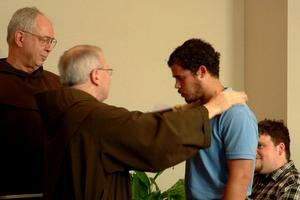 What did you do during your time with the Franciscans? A. My postulancy year took place in Cincinnati at the St. Anthony Shrine. This was a year comprised of learning, praying, working, and ministry. During this first year, I became acquainted with a routine of prayer using the Liturgy of the Hours and I grew close to my classmates and the friars in Cincinnati. I had a year in Cedar Lake, Indiana, for novitiate. The summer following novitiate, a group of us took to the streets on a pilgrimage across Virginia with our sights on the Holy Land Monastery in Washington, D.C. We took nothing for the journey but our Liturgy of the Hours, a blanket, and Bibles. And God provided at every step. We trusted in God and the goodness of people, and it was a great time of growth for me. Then I headed to Chicago to start my graduate studies at Catholic Theological Union. While in school, I took on a number of ministries that formed me as a minster to this day. I ministered at 8th Day Center for Justice and the Newman Center at the University of Illinois in Chicago. During the summer, I studied at the Franciscan Institute at St. Bonaventure, and during another summer I ministered on the Navajo Reservation. While all those major activities give outline to my experience, the most profound things that I did were much subtler. I grew closer to God in a rhythm of prayer, study, and fraternity. I grew closer to my brothers through adventures, discussions, and mandatory recreation. Q. 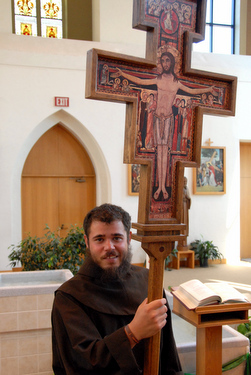 What did you learn from the Franciscans during your time with them? How did that experience help shape and form you into the person you are today? A. My time with the Franciscans was incredibly formative and there is little doubt that it has played a significant role in making me the man and minister I am today. Fundamentally, I learned about myself, God, and ministry. These are general themes of the formation process that continue to unfold in significant ways in my life and ministry today. To this day, my theology and spirituality is inspired by the life of St. Francis and the Franciscan Intellectual Tradition. The scene of Francis encountering the leper gives depth and breadth to our fundamental Christian imperative to love God and neighbor, and serves as a continual call to conversion for me. I find inspiration in Francis’s radical trust in God and trust that God is always reaching out to us, revealing Godself, and teaching us through creation. Also, my understanding of the Franciscan view of the incarnation gives my life and ministry a clear and challenging framework: God breaks into the world infinitely, continually and brilliantly every day through the magnificent and the mundane. In many ways, I am still chasing after Francis in my own way, still learning to be encountered by God the way he was, and growing to encounter others the way he encountered the leper. Since leaving the friars, Josh twice returned to Catholic Theological Union, where he met Ellen. The two discerned marriage and ministry and were married in 2017 with all of Josh’s former friar classmates in attendance. 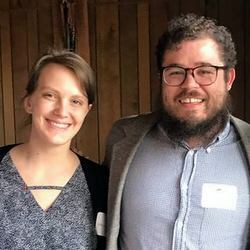 They both felt some calling to the missions, and their discernment led them to accept the positions of Parish Life Directors at Holy Cross Catholic Church in Jackson, Kentucky, to serve as missionaries and pastoral leaders of the parish. They have been serving at Holy Cross and in the community of Jackson—an area known for its challenges of poverty and addiction—for over two years now. The parish is small in number, with no more than 30 Catholics in the entire county, but it serves the broader community through outreach, evangelization, and children’s programs. Last year, Josh and Ellen purchased a 50-acre wooded farm a short distance from the church to live as neighbors amidst their community. They decided to turn it into a Catholic Worker Farm, focusing on prayer, retreat, and hospitality. For the past year, they’ve been renovating a log cabin and barn on the property to be used for a family in need and for weekly fellowship meals for the community. They have plans to build a small chapel in the woods and a hermitage with the hope of starting a ministry at the farm next year. And after much prayer, they decided to name the property Magnificat Farm Catholic Worker, inspired by Mary’s prophetic words. Josh and Ellen appreciate your prayers for their work. 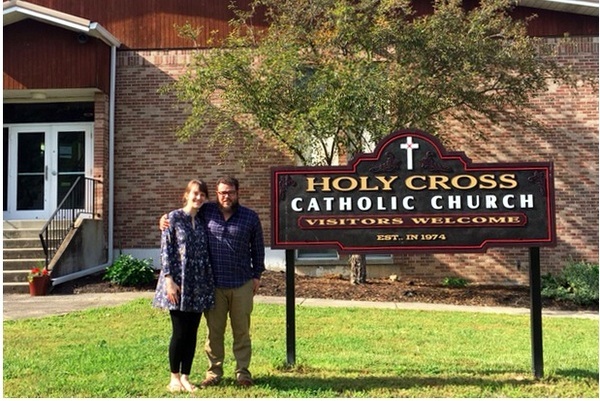 If you wish to support their ministries at Holy Cross, visit their website at www.holycrossjackson.org or write to them at 51 Brewers Drive, Jackson, KY 41339. If you would like to support Magnificat Farm, send an email to josh.vancleef@gmail.com or send a letter to Magnificat Farm, 2631 Rock Lick Road, Jackson, KY 41339. 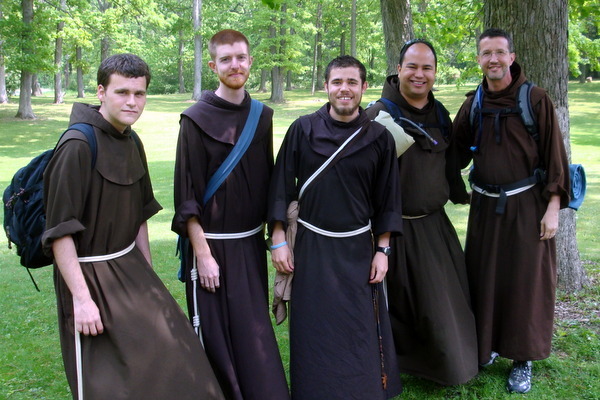 If you are interested in discerning a vocation with the Franciscan friars, visit www.franciscan.org/becomeafriar or contact Fr. Richard Goodin, Director of Vocations for the Province of St. John the Baptist, at 513-218-3547 or becomeafriar@franciscan.org. You can support the Franciscans by calling 513-721-4700 or sending an e-mail to friarworks@franciscan.org. You can also learn more about their work by visiting www.franciscan.org or www.stanthony.org.